Prostate cancer patients could undergo treatment in half the time and be spared some side effects, a major new study has revealed. The 14-year UK study found higher doses of radiotherapy over a shorter period is as effective as the standard treatment for prostate cancer, and could save more than 150,000 hospital visits a year. 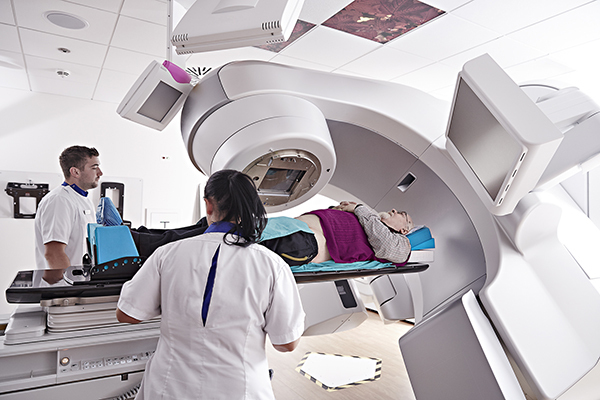 Moving from the standard 37-dose conformal radiotherapy to 20 doses of intensity-modulated radiotherapy also resulted in a ‘significant’ reduction in side effects, according to the study by the Institute of Cancer Research, London and the Royal Marsden NHS Foundation Trust. The findings have been welcomed by a leading prostate cancer nurse, who said a new treatment plan would free up time for staff to treat more patients as the number of new diagnoses in the UK rose 5% over the last decade. The trial followed more than 3,200 men being treated for prostate cancer between 2002 and 2011 at more than 70 research centres. It compared the standard radiotherapy schedule of 37 doses of 2 grays per day with two other regimes – one delivering 19 doses of 3 grays per day, and the other 20 doses of 3 grays a day. The results showed that after 5 years the 20-dose schedule was not inferior to the 37-dose schedule for treatment effectiveness or quality of life. Cancer Research UK, which partly funded the study, said the new treatment plan meant less disruption to patients undergoing treatment. The charity’s senior clinical adviser Arnie Purushotham said there was now a need to invest in radiotherapy equipment and urged the NHS to make the treatment available to all men who need it ‘immediately’. ‘Being able to quickly adapt, whether to new technology or a change to staffing levels to deliver better treatment, allows more patients to receive the benefits sooner,’ he said.